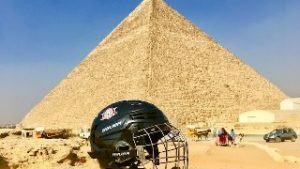 Pyramids scheme: Will Egypt warm to ice hockey? April 3, 2018 / NationalTeamsOfIceHockey / Comments Off on Pyramids scheme: Will Egypt warm to ice hockey? The hieroglyphics can be found adorning the tombs at Egypt’s ancient Beni Hassan burial site. They depict two men, each holding a long palm-tree branch, with slightly curved ends. They’re pointing them at the ground, crossing one over the other. Ignore the desert garb, and it almost looks like they’re taking a hockey faceoff. There’s an ancestral reason for this: Ancient Egyptians created a game in which sticks were used to smack around a semicircle created from papyrus fibers wrapped in leather. In essence, Sameh Ramadan isn’t trying to bring hockey to the Egyptian pyramids. He’s trying to bring it back. Ramadan is the president of Egypt Ice Hockey as well as a captain for its national club team, which will compete in the first Arab Club Cup Championship beginning April 3 in Abu Dhabi. It’s a tournament that seeks to spotlight the hockey programs of Algeria, Egypt, Lebanon, Tunisia, the United Arab Emirates and Morocco, the only nation among the group currently recognized by the International Ice Hockey Federation. “This tournament is a coming-out party for all these teams on an international stage,” Ramadan said. It’s another step forward for the nascent hockey program in Egypt, which is seeking an endorsement from the nation’s governing sports bodies as its official national hockey team, which is necessary for application to the IIHF. To be granted membership, Ramadan has to prove the program’s viability, relevance and capacity for growth. “Basically, all I need now is a letter from my sports minister that says, ‘Egypt Ice Hockey represents the ice hockey interests of Egypt.’ No money involved. Just saying the IIHF can talk to us. And then we can put in an application,” Ramadan said. 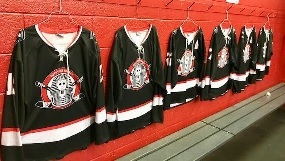 Egypt Ice Hockey’s sweaters sport one of hockey’s most memorable logos: the image of a pharaoh wearing a “Friday The 13th”-style goalie mask. In other words, Hockey Egypt has to get these gatekeepers’ attention. That is why it is playing a game at the pyramids. “We’re trying to get a full-sized rink. As of now, it’s going to be synthetic, for budget reasons, but we’re trying to get the sponsorships to do a full ice rink. We’re trying to target December or January in the event we can do an ice rink because it’s cold enough,” said Ramadan, who said several sign-offs from the government are required before the game can happen. Other events have been held at the pyramids — everything from a David Guetta rave to an international squash tournament. But never hockey. Well, at least not since B.C. “Hockey being played in front of the pyramids … that would be an iconic image. That would sweep the globe,” said Rob Ruszala of The Hockey Foundation. Ruszala would know about playing hockey in iconic places. The last game he organized made the Guinness Book of World Records. The Hockey Foundation is a New York-based nonprofit organization that seeks to support and grow the sport in emerging communities. In places such as, for example, the Himalayan region of Ladakh, India, where The Hockey Foundation helped facilitate a world record for the highest-altitude hockey game, at 14,340 feet above sea level. When it comes to a game at the pyramids, it’s not simply for the stunning visuals and novelty of the stunt. “We’re not doing it for the photo op. We’re doing it for the legacy impact,” he said. The legacy of hockey in Egypt is one of humble beginnings. Egypt has a population of 98.9 million people but only three ice rinks, none of them regulation size and all of them housed within shopping malls in Cairo. Ramadan’s parents lived in a suburb of Cairo, and the family’s apartment was across the street from one of the three ice rinks in Egypt. 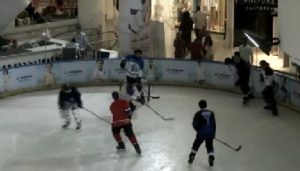 The rinks are what one might expect them to be: each located within a mall in Cairo, each about 25 percent the size of an NHL rink (or about 300 meters long), with no Zambonis or even skate sharpeners. The rink near his parents’ home opened in 1997. Ramadan remembers asking his cousin to bring some hockey equipment to his apartment so they could go across the street and play. Fast-forward to 2016. Ramadan is living in New Jersey and a father of two daughters. His friend Yasser Ahmed, the Egyptian national team’s goalie and director of hockey operations, discovered that there was an actual hockey team playing at the old rink in Cairo: The Anubis Club, a group of local players and a program completely anonymous to the local populace. “Back in 2004, we went to play at a rink, and it just so happened that some Egyptians joined us. And we ended up with a nice little group,” Mike Letanzey, a Canadian ex-pat, told CGTN in 2017. Ramadan, who has an MBA in marketing, reached out to the team. To get noticed, he reasoned, they needed to rebrand. The team became Egypt Ice Hockey, sporting one of the most memorable logos in the world: the image of a pharaoh wearing a “Friday The 13th”-style goalie mask. By July 2016, Egypt was playing in its first international ice hockey tournament: the African Ice Hockey Cup for club teams, held in Morocco. (The tournament had the support of the Czech Republic ice hockey federation, which even donated a bus with Jaromir Jagr’s image on its side.) The rink’s size allowed for only 3-on-3 hockey — the only regulation-sized rink on the continent is located in South Africa — and the Egyptians were, well, very much the newbies there. “We had no business being there with that specific team,” Ramadan said. But the trip changed the course of Egyptian ice hockey — thanks, in part, to Reddit. A man from the American embassy showed up at the Moroccan club tournament, asking to buy a Team Egypt jersey. Ramadan was shocked by this happenstance and asked how the man knew about the team. 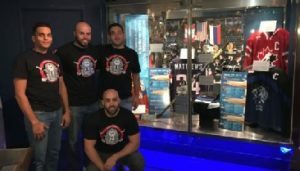 It turns out the Egyptian national team had gone viral on the Reddit hockey board, thanks to its unique branding. It was at that moment, Ramadan says, that everything clicked: a collection of ex-pats and club players could be Egypt’s national team, and together they could push for IIHF recognition. That tournament is also where they hooked up with The Hockey Foundation. Ruszala sat down with Ramadan and Ahmed about 18 months ago to begin formulating a plan for how to support and grow hockey in Egypt. It was clear, right away, that viable gear was the most pressing issue — including, for example, giving the goaltenders something more than shin guards. “They only had one set of goalie pads, and every game they’d only have one goalie suit up. Mite or adult, it didn’t matter because it was one set of pads. I was floored by that,” Ruszala said. Getting it revved up depends largely on getting Egypt to sign off on hockey officially and then investing in it. Ramadan, ever the marketing guy, decided that his best shot at this wasn’t to narrowly pitch hockey to the Youth Sports Minister and the national government. At the World Youth Forum last November, he made his pitch for a full winter sports federation that would include hockey. He doesn’t want all of this opportunity just for men and boys, either. Ramadan has a 10-year-old daughter who plays goalie and an 8-year-old daughter who’s a forward. Kuwait and UAE have women’s teams, and he feels it’s essential that Egypt get women involved in winter sports as well. “It’s Egypt. It’s a Muslim country. We want to promote women participating,” he said, pointing to the recent visit by members of the UAE women’s team to the Washington Capitals, with culminated with forward Fatima Al Ali dropping the ceremonial puck at a game while wearing a Capitals jersey and a hijab. Ruszala said that participation of women in hockey is one of the harbingers The Hockey Foundation looks for in measuring the growth of an emerging hockey market. “It’s not just for boys. It’s all-inclusive,” he said. They want to see more participants, not only on teams but also at clinics. “If we’re investing time and equipment and the numbers are stagnant, maybe that region isn’t ready for the sport yet,” Ruszala said. But the last requirement is, at this point, the trickiest one for Egyptian hockey: formal recognition. Which brings us back to the pyramids. Erica Jong once referred to jealousy as “all the fun you think they had.” No matter what the level of play in a game at the pyramids might look like, the fact is that one will have been played there. Ruszala has already seen the effect a game in one country can have on another. “The Pakistanis reached out to us after the India game,” he said. The pyramids game isn’t just about the growth of hockey in Egypt, though Ramadan sees it as an essential step forward down that path. It’s about making a statement in Africa and the Middle East about the viability of the game, the continuing effort to alert the region to hockey’s presence and how it fits into their changing approach to sports. Adrian Mizzi the traveling goalie has arrived in Egypt. Having already crisscrossed through snow and sand, the humidity of Southeast Asia now awaits Kuwait in a milestone of a season. Entering the final straight of a hectic second half of the 2017/18 season, sees the Gulf nation compete at the top division of the 2018 IIHF Ice Hockey Challenge Cup of Asia in Manila, Philippines. Contested between 3-8 April with Mongolia, Thailand, Singapore and hosts Philippines awaiting, the challenge comes in the wake of another significant first for Kuwait. Barely a month has passed since taking the plunge and competing at the 2018 IIHF Ice Hockey World Championship Division III Qualification. Debuting in wintry Sarajevo saw Kuwait suffer consecutive reversals against hosts Bosnia & Herzegovina, eventual runaway winner Turkmenistan before closing things off with a tight encounter against their regional rivals United Arab Emirates. Despite three straight defeats, it was to be one giant leap for Kuwaiti hockey. “It was a big level, but it was a huge step for Kuwait to be there,” said Kuwait’s assistant coach Bojan Zidarevic on moving up to the World Championship qualification stage. “But for each game, we are learning more and our goal is set for the next Asian Winter Games. Last year it was held in Sapporo and now we have four years to prepare our young kids for that tournament,” he continued. Zidarevic, a former World Championship player for Serbia, arrived in Kuwait three-and-a-half years ago. Apart from working with the senior national team, he is also developing teams from U15 to U10 level while also still playing for Kuwait Stars. Being upended 1-44 against the might of Japan at the Asian Winter Games, Kuwait got a harsh introduction to international hockey back in January 1999. Followed by years of small but consistent steps forward, a considerable change took place when hosting the 2015 IIHF Ice Hockey Challenge Cup of Asia Division I. With hockey being showcased on in Kuwait City, three straight wins against India, Oman and Macau increased efforts almost overnight. “Winning that tournament changed everything. We got good points from the IIHF and we started our development program,” said Zidarevic as Kuwait then continued their winning streak on home ice by retaining top spot at the 2017 IIHF Ice Hockey Challenge Cup of Asia Division I in Kuwait City. “We now have 160 kids, starting from the age of four to 15 all fully equipped. We now hope our U20 national team will soon play in international tournaments and we also have our women’s national team who are looking to play at the Challenge Cup of Asia,” said Zidarevic on the burgeoning interest for hockey in a country with a population of just over four million. With interest spreading down the ages, the most pressing challenge facing Kuwaiti hockey is now to try and channel the youth into an aging senior national team. “I have played for 25 years and many of those as the goalie for the national team. I’ve had to operate my shoulder, twice I had surgery on my right knee, another one of the left knee, so my body is collapsing,” said Jasem Al Sarraf, who played through the pain barrier as the first-choice goaltender clocking up 154:43 minutes in three games at the recent World Championship Division III Qualification in Sarajevo. “We are changing many things at the moment. I am 40 and we have another six to eight other players finishing this year as we are 40 or older. There is a new team coming from juniors, so this year is going to be tough for us as we are changing everything. We need to give the youth more experience and leave them on the right path,” he continued. Well aware of his playing days now entering its twilight days, Al Sarraf will cherish many memories from a career encompassing quarter of a century. One such took place during Kuwait’s regular visits for training camps in Sweden, where the unexpected presence of his hero gave the whole Kuwait team a lift in their preparations ahead of the 2015 IIHF Challenge Cup of Asia. “We met Nicklas Lidstrom twice that year when we were in Hallstahammar in Sweden. First, he came to see us as he had heard about us and wanted to show his support. The second time we played against a team of his son and he was happy to see us moving up a level since he first saw us,” said Al Sarraf who was touched by the humility shown by one of the all-time greats representing Sweden and Detroit Red Wings. “It was just like a dream. You have watched NHL on television, you are a fan of Red Wings and then you get to meet him. He was very happy to see us, so it was great to know that we have him to support us,” said Al Sarraf. Despite now being on the verge of hanging up his skates at the national team level, Al Sarraf is set to continue playing in the domestic championship while sharing his know-how to the next generation of athletes. Relishing a challenge, Al Sarraf’s involvement will also include developing a wide range of winter sports such as speed- and figure skating, curling, and skiing, all eager to follow in the footsteps of the recent success of hockey. “It is a country of sand and it is plus 50 degrees Celsius, but when it comes to hockey we have good management, a nice arena with two ice surfaces and players turning up for practice. In the end, our hard work will bring good results and I believe we have a good plan for the future,” said an optimistic Zidarevic.